Posted by Equestrian Western Australia on 22/03/2019. A meeting was held on Monday 18th March with all members of the EWA Jumping committee present, the EWA Chair and CEO also attended this meeting. Concerns were raised by some members of the Jumping Committee that a number of jumping members were dissatisfied with how the sport of jumping was being managed. The tenure of committee members was raised and it was clarified by the CEO that all members of the committee fell within the requirements of the EWA Constitution. After considerable discussion whereby all members of the committee had an opportunity to speak, it was decided by vote that the best way forward was for all of the current members of the Jumping Committee to stand down and call for election of a new committee. All members of the committee are welcome to nominate for the forthcoming election. 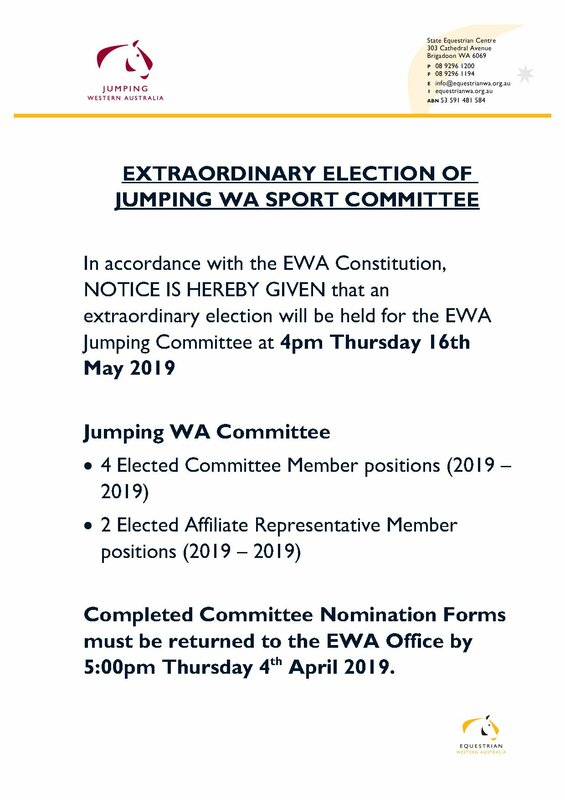 EWA would like to assure our members that the Jumping committee has at no time breached any governance obligations or code of conduct or behaviour. Essential business of the Jumping Committee will be administered by 3 of the previous committee and the CEO of EWA in the interim. EWA would like to acknowledge the work of each member of the Jumping Committee and recognises the importance of all volunteers on our Sports Committees. Nominations for all elected positions are open from today 21st March, nominations close 5 pm, 4th April, election 4 pm, 16th May. Skills ideally required by nominees for the Jumping committee include expertise in Governance, Finance, Communications, Marketing, EWA Officials, coaching and HP programs. As per the EWA Constitution 31.4, elected members will hold office only until the next Annual Election.